Have you heard? Strong is the new pretty. It's true. And aerialists are STRONG (and pretty because of it, if you ask me). 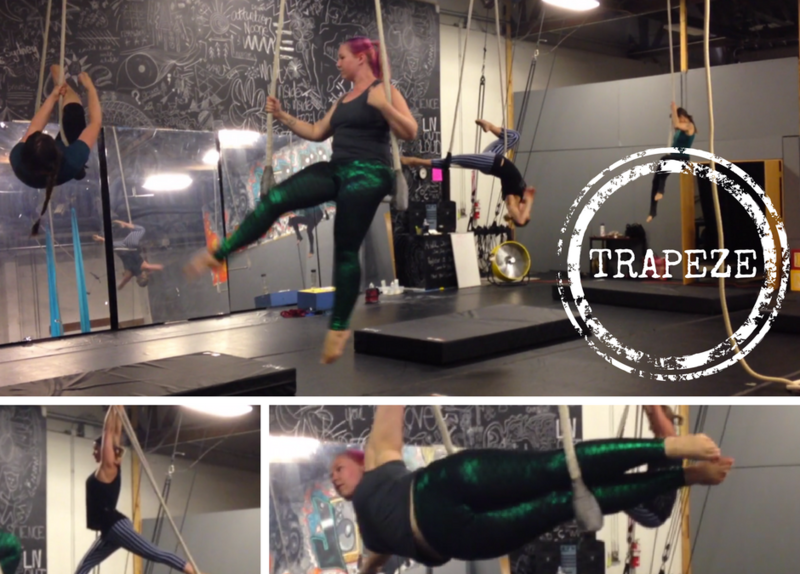 Like all dancers, aerialists like to make things look easy, but don't be fooled, a lot of work goes in to making dangling by your ankles while spinning like the Tasmanian Devil look easy. But, we all start somewhere and training with Jack Stocklynn is an excellent place to both start and advance. Jack effortlessly offers a comfortable, playful and imaginative environment from the moment you walk in the door. In this class we started off with a warm-up, but not a boring or formal warm-up, rather one that incorporates going around the circle saying your name and your preferred pronoun, then going around again naming your favorite bird and why it's your favorite, then comparing the shapes we are making to animals or objects. Sneaky distractions like these magically help you forget you are doing push ups or stretching your splits! After getting our muscles stronger and more pliable we move to the trapeze for some strength training. The great news about this is that it's incremental so you don't have to be able to do, for example, A PULL-UP to begin. You build up to that over time. Turning up-side-down and even just hanging out up-side-down are things we practice during this section of class. Jack demonstrates the technique giving you tips on which muscle groups to use and how to progress. Dance companies rehearse. Sports teams practice. In aerial class, we train, which is a good way to look at it, because no one is naturally born being able to do these things. Everyone must train. Next up we learned some moves! Different studios call things by different names, but we worked on single knee hang, gazelle, meat hook and starfish. Each of these are a repertoire you will build up over the course of the 8 week series. Finally, we string together many of the skills we learned into a short phrase (seen in video). At this stage everyone gets to work at their own pace. For those who are new, moving slowly through the movement and modifying anything that seems too advanced is perfectly acceptable. For those who are more skilled, focusing on transitions, performance quality and even adding a spin are advancements that really make you feel like you're dancing in the air! Usually disclaimers go at the beginning, but this one I've decided to add at the end. I was an aerialist for 7 years dancing with AWOL Dance Collective (where this class is held) and I still teach on occasion at the Circus Project, so this work was not new to me. However, I very distinctly remember the first time I took an aerial class and after it had to wait 10 minutes before my hands and forearms could grip the steering wheel enough to drive home - muscles you never knew you had, and a fatigue you never knew was possible. And with my training experience I can assure you that time, patience and determination are key to success in this style. So go in ready to enjoy the process and teach your body to do some pretty incredible things! Learn more about Jack StockLynn and Sir Cupcake's Queer Circus.